We have created an App ID, distribution certificate and provisioning profile. Push Notifications were not initially enabled. We now need to implement Push Notifications in the app. We have enable Push Notifications in the App D, check the provisioning profile, the provisioning profile was invalid, updated it, and downloaded the latest provisioning profile to use it for next time. We then integrate the APIs for Push Notifications via APNS in our code. We have re-checked the App ID. Push Notifications are enabled for development and production. In the Provisioning Profile, the Push Notifications option is shown. Why are we getting this warning via email? Its all about the provisioning profiles. STEP 1: Go to https://developer.apple.com/account/ios/certificate/ and see the Active iOS Distribution Provisioning Profiles you need for your app. Then click on it and make sure Enabled Services has Push Notification enabled. If it doesn't then click on edit and enable it by following the steps provided by Apple. If it is enabled then perfect. STEP 2: Delete any Invalid Provisioning Profiles you see related to app (just the invalid ones for YOUR app). I'll tell you why in the following steps. STEP 3: Go to Xcode -> Preference -> View Details (for your Account) -> [OPTIONAL: To be sure invalid one is gone, rt-click on any provisioning profile, select "Show in Finder", then Delete/Move all the provisioning profiles from that folder.] Now click Download All Profiles. This will replace local provisioning profiles with current ones. Click DONE. STEP 4: Go to your app Targets -> Build Settings -> In Code Signing, expand your Provisioning Profile to show Debug and Release tabs. By default it will be on Automatic (which is why your app was probably automatically using the invalid profile that we just deleted in step 2). For Release, to be on a safer side, select the Active Provisioning Profile with enabled Push Notifications as seen on step 1. You shouldn't get any emails now. @Djeeraj V.S. is correct. Cordova added some conditional compilation to remove this requirement for apps that do not need Push notifications. You could comment out the code in in Classes\AppDelegate.h as per this answer, but its better to add the compilation symbol DISABLE_PUSH_NOTIFICATIONS via the UI so you can continue to benefit from future Cordova upgrades. I come from .NET background so i am familiar with conditional compilation but had to spend a bit of time working out how to get the compiler flag working in XCode. I had the same warning and here is how I solved it. First of all, when you archive your project, under entitlements if you don't see aps-environment and your app uses push notifications, then you will get the warning mentioned in the question. 1- Make sure your distribution profile is valid in Apple's Portal. - If it's not, then regenerate it. 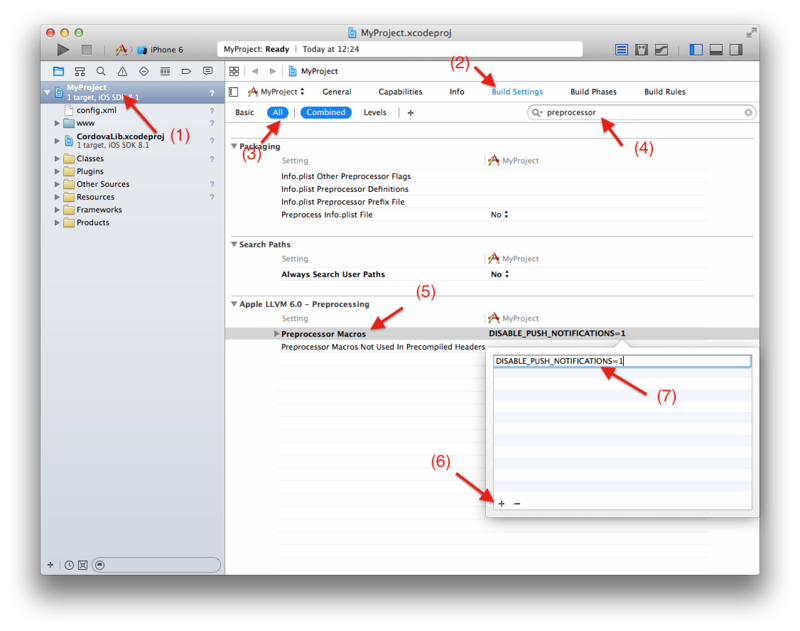 2- If your distribution profile is valid, then in XCode, navigate to Preferences and then click View Details. At this point under Provisioning Profiles, make sure you don't have invalid distribution provisioning files. If there are invalid ones, then make right click and move them to trash. If you don't have the valid one, then download it from the Portal. 3- Go to Build Settings -> Code Signing and for everything choose the distribution provisioning profile. At this point if you archive, you can see aps-environment in your entitlements and the warning email won't come. I have a cordova app, where I have had notifications previously, but wanted to remove it from the app. I tried following the above answers, but I still encountered this issue when I uploaded the build. I realized, that I had a plugin installed, who used the notification setting, and somehow kept some settings activated for notifications. I solved the issue by removing the ios platform completely cordova platform rm ios, adding it again cordova platform add ios and making sure that the plugin was removed from the ios.json and fetch.json files. Not the answer you're looking for? Browse other questions tagged ios apple-push-notifications or ask your own question.